Welcome intrepid clickers to the World Building Challenge. This activity is to help promote creativity, casual collaboration, and perhaps even generate some ideas to include into our community. Once a month an image will be posted here. Images may be maps, locations, items, etc. People will have an opportunity to write and post something brief to describe something about the image. Come up with a history, guess who might live there, how an object is used, a legend to go along with it. The only limitation is your imagination. People are welcome to build onto previous ideas they want to expand. People are also welcome to quote, high five, or otherwise praise submissions they enjoy. 1. Try to make submissions at least 250 characters. 2. See an idea you like? Want to use? Contact the creator! 3. Anyone who has an image they'd like to use for a challenge, please PM The Cartographer. Please try to include a source. to gain strength, improve posture, and burn calories due to this ingenious invention. It was said that two lovers stole away in the night, ignoring their family's refusal for them to be together. They ran towards the ocean, then kept running South of Rhy'Din until they found the highest cliffs they could see. Hand in hand, it took all night until they reached the tallest peak. It should be said that the two lovers' families were not quite 'normal', being related to ancient gods, which is not quite that uncommon for those of Rhy'Din. Once the two reached the highest peak, the gods in their celestial home saw the two star-crossed lovers and forbade their embrace. 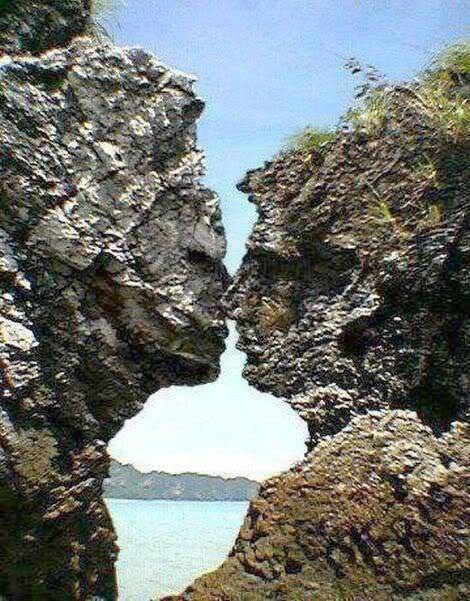 Just as the two lovers were about to kiss with the rising sun, the gods pulled up the mountains around them and encased them in stone. Now, the two lovers will forever be waiting for that life fulfilling embrace, locked forever in the same cliffs that they ran to... for all eternity.